The economic developments from the Republic of Moldova, priorities to improve the business environment and investment opportunities were discussed by Prime Minister Pavel Filip and Deputy Assistant Secretary for Manufacturing at the U.S. Department of Commerce's International Trade Administration, Ian Steff, during a meeting in Washington. Prime Minister Pavel Filip highlighted that the Republic of Moldova registered positive economic development, the economy and banking system being stabilized. Following reforms promoted in the banking system, this year, Romania became a stakeholder of a bank from Moldova, while last week, an agreement was signed foreseeing the sale of stakes of Moldova Agroindbank. Pavel Filip declared that the reforms promoted by the Government, including actions taken to facilitate the activity of economic agents, which, in the end, ensured an economic growth of 4% in 2016 and 4.5% in 2017. Last year being created around 60 000 jobs, while investments in the Free Economic Zone reached 115 million USD. "The executive will continue to identify new sources for economic growth, by stimulating business and attracting investments" Prime Minister said. In his turn, Ian Steff expressed his interest in exploring the investment opportunities in Moldova, especially in the IT sector, infrastructure, intellectual properties and defending the author rights. At the same time, the US official presented a number of programs of the U.S. Department of Commerce that can be used by entrepreneurs from the Republic of Moldova. 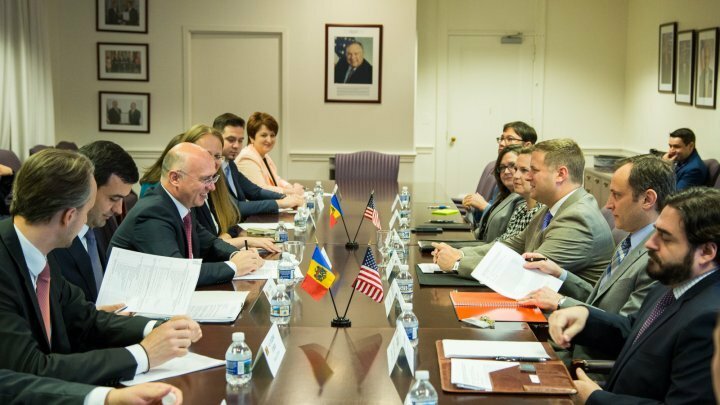 Throughout last year, trade between the Republic of Moldova and the USA reached over 89 million USD, which is a 26% growth compared to 2016. Therefore, the USA is ranked 16th among the partner states that the Republic of Moldova has trade relations with.